In setting up or redesigning a cafe, buying cafe furniture is one aspect that you need to take seriously. Aside from your food and drink offerings, your furniture can help determine the success of your business. That said, when buying cafe furniture, there are some things you need to take into consideration. Floor space will help you determine not just the type of furniture to get but also their size and quantity. You have to ensure that there is enough room for your customers to comfortably move around because nobody wants to stay in a crowded or poorly arranged space. Customers and servers must be able to go around the area without the risk of bumping into tables and chairs and knocking down food and drinks. The first thing customers notice when they enter your cafe is not your drinks or your service but the physical aspect of your cafe. Style helps determine the ambience of your cafe so you need to make sure that it translates well to every aspect of your establishment especially to your furniture. There are many cafe furniture styles available in the market and you have the freedom to choose whether you want to go the traditional route or be a little more experimental. No matter how beautiful your chairs are, customers will only love them if they’re comfortable. 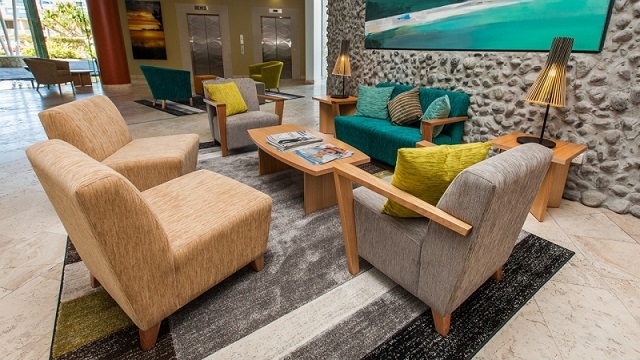 Customers go to your cafe to relax and unwind so choose comfortable furniture that will do just that. Before buying chairs, test them by sitting on them first to determine whether they’re comfortable enough. You are purchasing furniture for a reason so choose those that will function well regardless of the season. Your best bet are stackable cafe furniture that can be easily moved around and stored when needed. This is especially important for accommodating groups of various sizes and also for cleaning and maintaining your cafe. If you have adequate outdoor space, you may also want to invest in cafe chairs that can be for both indoor and outdoor use. There is no use buying furniture if they will only last for a while. Avoid continuous replacements or repairs by investing in good quality furniture made from durable materials that will last a long time. 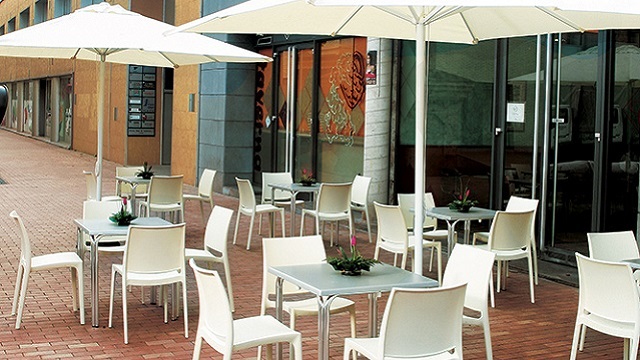 Durability is especially important for high traffic establishments, where furniture can sometimes be handled roughly, and also for outdoor seating areas, where they can be exposed to the elements. Your colour choices will depend on the theme of your cafe. It doesn’t just contribute to the aesthetics of your place but also to the overall ambience. Colour has a psychological effect on people so you have to take extra care not to choose those that unconsciously turn people away from your cafe. Warm colours will work best. Red, for example, stimulates the appetite, encouraging customers to eat more. Orange, on the other hand, encourages social interactions and conversations. If you want your cafe to be on trend, check out the latest colour suggestions for the year. You may want to refer to the colour of the year and colour pairings released by Pantone every year. For 2015, you can get some ideas from our article on our suggested furniture and colours for 2015. Furniture is an investment for your cafe but it doesn’t necessarily mean that you have to spend a fortune. In determining your budget, do not forget to take into account other costs such as customisations, delivery, and maintenance. By taking time to consider all these factors, you will be able to determine exactly what type of cafe furniture you will need. We will be happy to help you find the perfect furniture for your cafe. To browse Nextrend Furniture’s line of cafe furniture, visit our Cafe Furniture page.